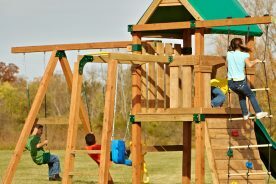 The Chateau II Wood Swing Set manufactured by Gorilla Playsets is bound to put a huge grin on any kids face when they see this in the backyard! 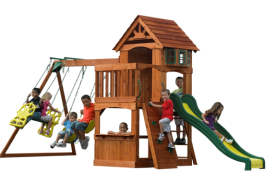 Providing endless amounts of fun with all the great features this swing set has to offer from the sandbox and slide, to the rock wall and, of course, the swings. It’s a huge hit. 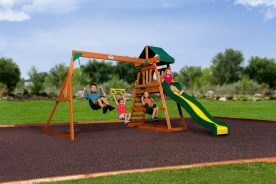 Parents favor the diversity of play and easy upkeep this swing set provides, as well as the durability of each component put into this swing set. Giving it years and years of use for any sized family from small to big! 1 What great features does the Chateau II Wood Swing Set offer? 6 What kind of warranty does the Chateau II include? 7 Why should I buy it? What great features does the Chateau II Wood Swing Set offer? 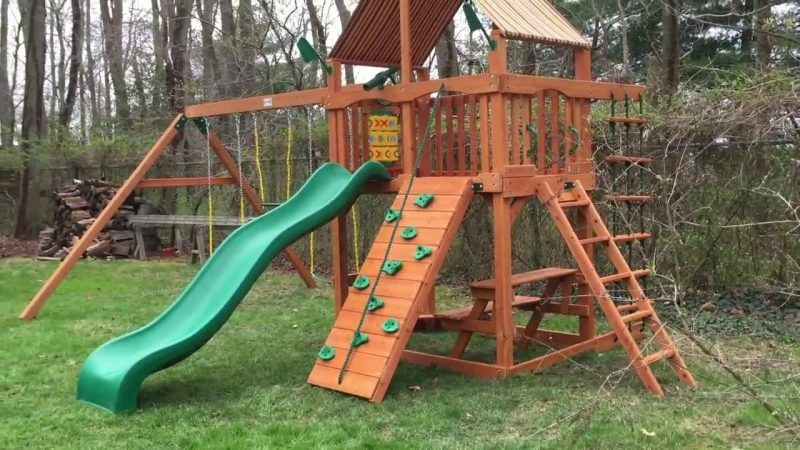 Most swing sets have a slide included, but the slide on this swing set is no average slide. It is a wave slide! Compared to the standard straight decline, this one has grooves that are similar to waves. Kids will throw their arms in the air in excitement riding the waves off this slide! The waves descend from the platform, which is 5′ feet above the ground and 4′ by 6′ feet in size offering plenty of room for children to pass each other with ease. On this platform there is no limit to imagination and fun. Children can pretend to be the captain and direct their ship in any direction they wish with the innovative steering wheel. Going along with the steering wheel every captain or first mate needs to be able to see where they are going and the play telescope will show them the way. What’s a ship without flags? This swing set includes two flags in the flag kit. Also located on this platform is the Tic-tac-toe panel. 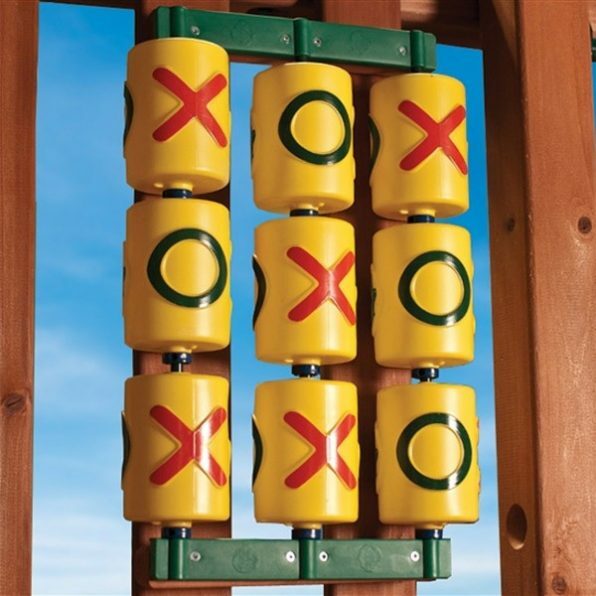 Children can challenge each other in a friendly game of Tic-tac-toe or use it as a way to decide who gets to be the captain, master of the X’s and O’s. Covered by a vinyl canopy kids can enjoy all the features the platform has to offer in rain or shine. The Gorilla Chateau swing set has so much to offer when it comes to climbing and swinging. There are three entry points to the platform for the children to use. 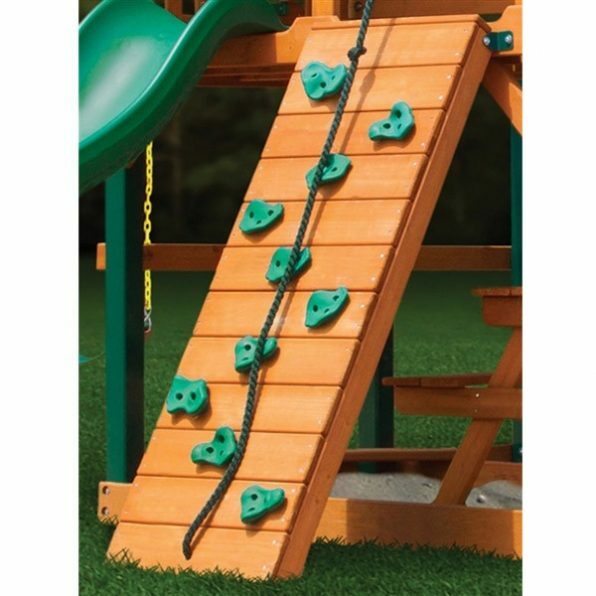 If you have a little adventurer in the family they are sure to enjoy getting a grip on the rock wall or holding onto the rope and climbing in order to reach the top. A step down but still sure to catch some eyes is the rope ladder. It is built with three ropes and wooden bar steps to ensure a sturdy climb. For those eager to reach the platform the safe entry ladder is the fastest way to the top. It is a solid wooden ladder that includes two safety handle bars at either side of the entry to the platform. Now it wouldn’t be a swing set if it didn’t have swings. There are three swings in total. Of the three you have two belt swings and a trapeze swing. Expose children to a little gymnastics and get their imagination going. With this trapeze swing they can monkey around, hang from their arms as if swinging in the trees. 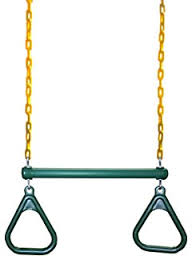 Kids are sure to get creative with all the different things and tricks they can do with this swing. The chains on the two belt swings as well as the trapeze swing are covered making sure hands don’t get pinched, also providing easier upkeep as well as prolonging the life of the swings. Last but not in the least, children can take a break and catch their breath on the on side picnic table. This table is located underneath the platform ensuring maximum sun protection. They will be able to enjoy a snack in the cool shade out of the way of play but still right in the middle of all the action. Next to the picnic table and still under the shaded cover of the platform is the sandbox. No need to take a trip to the beach the kids can build a sand castle in their own backyard, or just enjoy the nice and cool sand under their feet. The cedar Chateau Deluxe is recommended for residential use only. This swing set is intended for ages between three and eleven years old and should hold no more than 8 kids at one time. Adult supervision is recommended at all times when children are playing on the swing set. The safest material to lay around the swing set would be mulch or recycled tire. When assembling this swing set be sure to wear protective eye goggles and gloves, make sure all tools are used correctly and within the instructed safety guidelines such tools require. There will be several phases of construction that may require two people to lift and secure lumber in place. Make sure there are no children present while assembling this swing set. It is recommended you leave a six foot “safety zone” around the swing set. This means the swing set should be no closer than six feet to the house, shed, possible power lines, fences, trees and even driveways. All bolts and screw heads should be checked regularly to insure structure stability. Any lose bolts or screw heads should be tightened with the appropriate tool. The most used play features should be more frequently checked such as the ropes, swings and slide. Look for any cracks in the slides or swings and extreme frays in the ropes or lose ropes. These check-ups not only ensure children’s safety but also help aid in upkeep; prolonging the life of the swing set. Before purchasing any swing set it is very important to make sure you have the appropriate amount of yard space. 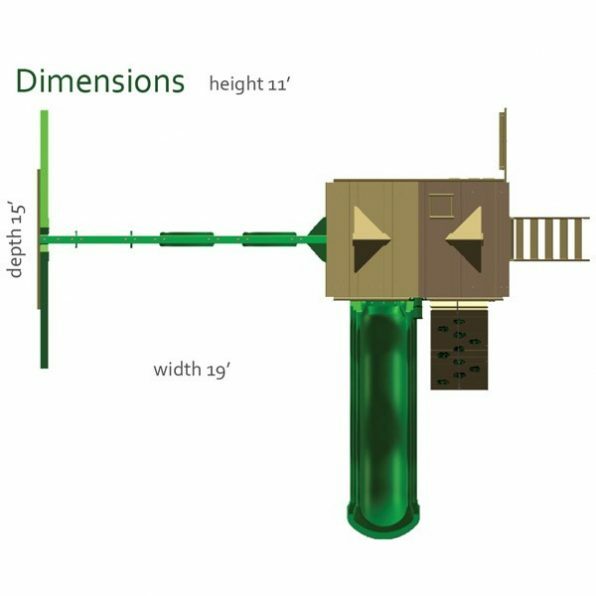 When checking the measurements remember to factor in the six foot “safety one” distance between the swing set and any structures around. The dimensions are 19′ feet in width by 15′ feet in diameter and 11′ feet 2″ inches in height measuring to the top of the vinyl canopy. This swing set would be ideal for a moderate to large sized yard. 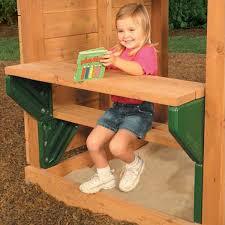 The Chateau Deluxe wooden swing set comes packaged in six boxes with a combined weight of 722lbs. All lumber is factory stained giving it resistance to rot, decay and insect damage. The beams for the swing beam are protected by Timber Shield. All lumber is carefully inspected for defects that may cause instability. Material is pre-cut, sanded and even pre-drilled for your convenience. The assembly should take about 6-8 hours to complete. You will need a few tools to complete the assembly such as a level, tape measure, hammer, and shovel. All swing sets by Gorilla Playsets come with an instruction manual. This manual will show step by step instructions on how to assemble your Chateau Deluxe set very easily. In it is pictured every item included in your packaging. It is recommended to check that each part listed is not missing or damaged. The worded description is also a great part of this manual. It not only tells you what to do but describes the parts you’ll be working with. There is also a printed ruler on the side of some pages to further insure you have the correct part. To ensure you get the most out of your swing set carefully read and follow the entire manual. It is recommended that a sealant be used within the first ninety days after assembly. Many hardware stores offer such sealants, be sure to inform a store clerk that may be helping you pick one that is indented for the kind of weather the playground may endure from extreme sun exposure to heavy snow fall. There is also a factory sealant you can buy straight from the manufacturer. Check and tighten any bolts, nuts, or screws before every seasonal use and once during. If you live in a climate that experiences extreme cold and/or snowfall remove vinyl canopy, swings, slide and ropes; store these items inside until next season use. If the belt swings or trapeze swing is squeaking use Pam, Mazola or Olive oil, DO NOT use any petroleum based products such as WD-40 or motor oil. Avoid using pesticides and instead take a cotton ball or cloth and dab dish soap in corners that wasps and yellow jackets tend to nest such as under the platform or in the clubhouse. You may also wipe the center of the slide every 2-3 weeks with wax paper to speed it up. What kind of warranty does the Chateau II include? When receiving your swing set makes sure you go through all the warranty information in the manual. It will tell you in depth exactly what is and is not covered. You must make sure you register your swing set to claim any warranty. There is a 10 year warranty for normal conditions and use for structural wood components, this applies to any defects due to workmanship or material. For all other parts there is a 1 year warranty. Don’t wait to buy. 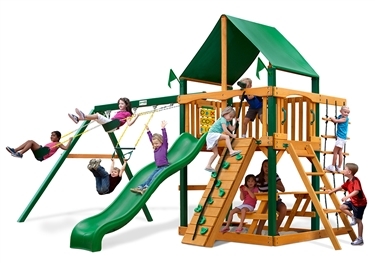 The Chateau II wooden swing set is a great addition to any backyard. With all the swing set includes it’ll give children hours of endless fun. They can monkey around on the swings, sail the seas as captain of their ship or relax with their toes in the sand. The quality and size of this swing set will last years and years and the smiles on the kid’s faces will make it all well worth it. Don’t pass this one up, its top notch!